1 Calming Comfort Blanket Review: How Does it Work? 4 Calming Comfort Weighted Blanket: How Effective is it? Stress is taking over our lives! We all struggle to earn more so that we can spend more and that leaves a serious mark on our well-being. What we really need? The only things we truly cannot do without are food, water, and sleep. Good quality sleep allows us to regenerate and improves our brain function. We are more productive and perform better after we have had a good night sleep too. Unfortunately our culture has interfered with our natural sleeping patterns and, as a result, most of us struggle to achieve the balance we have lost due to the sleep deprivation. Calming Comfort is a weighted comforter which aims to help you calm down and relax so that you can fall asleep faster and stay asleep longer without using any drugs. It is an all-natural approach to better good night sleep that will help improve your social skills, immune function, mental health, concentration, and productivity. Calming Comfort Blanket Review: How Does it Work? Weighted comforters are becoming increasingly popular due to their all-natural calming effects. However, they are not a modern invention. In fact, these blankets have been used for years mostly as therapeutic aids in psychiatric hospitals and to address physical and mental conditions such as high blood pressure, anxiety, and even autism. Their calming effects are long recognized and exploited, and now that they are mainstream you can benefit from them too. 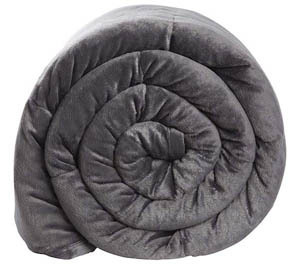 I have reviewed many weighted comforters, and they all had a calming effect on me and helped me with my anxiety issues. Therefore, whenever you feel stressed, anxious or just overwhelmed by everything that goes on around you, you too can simply cover yourself with a weighted duvet and it is sure to help. Weighted blanket contact is like a free hug- you immediately get a serotonin boost running through your veins, and it feels like a warm wave of positive energy. Calming Comfort quilt works the same way- the added weight induces light pressure, and as soon as you sense it your body and mind begin to calm down. You can use it to relax during the day, but it is an excellent drug-free method to get yourself in an ideal state for sleeping too. Scientific studies have already proven that the gentle pressure the weighted comforters put on your body enhance the production of both serotonin and melatonin- two natural calming chemicals. Calming Comfort blanket has that same effect, as soon as you lay it on top of you or wrap yourself in it you will feel like a swaddled baby- calm and comforted (obviously this quilt justifies its name). As you can see, there is not much difference in the effects provided by different brands of weighted blankets. They all share the same principle- deep touch pressure therapy (DTP). For this reason, you should choose the one that best suits your needs based on its price, design and weight and size. 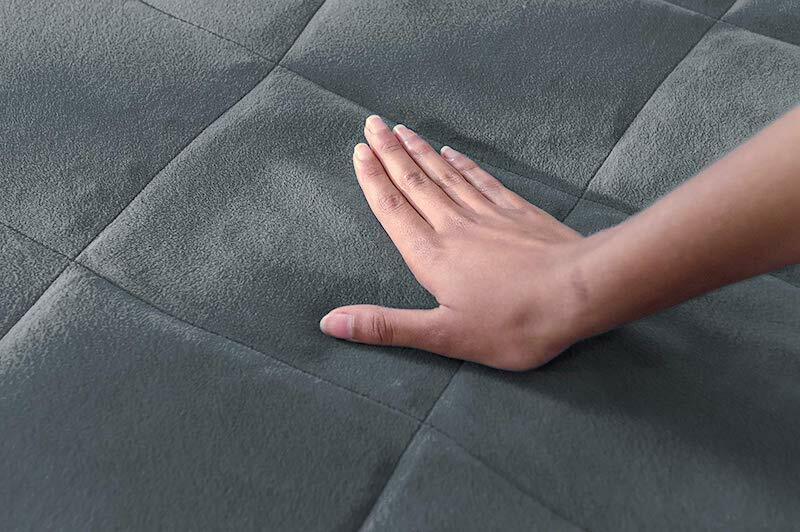 For example, the Gravity weighted blanket offers a variety of weights, sizes, and colors, but it is also one of the most expensive options on the market. The Calming Comfort blanket is a budget-friendly alternative that will offer the same benefits at a fraction of the price. This comforter comes in four different weights: 10, 15, 20, and 25 lbs. 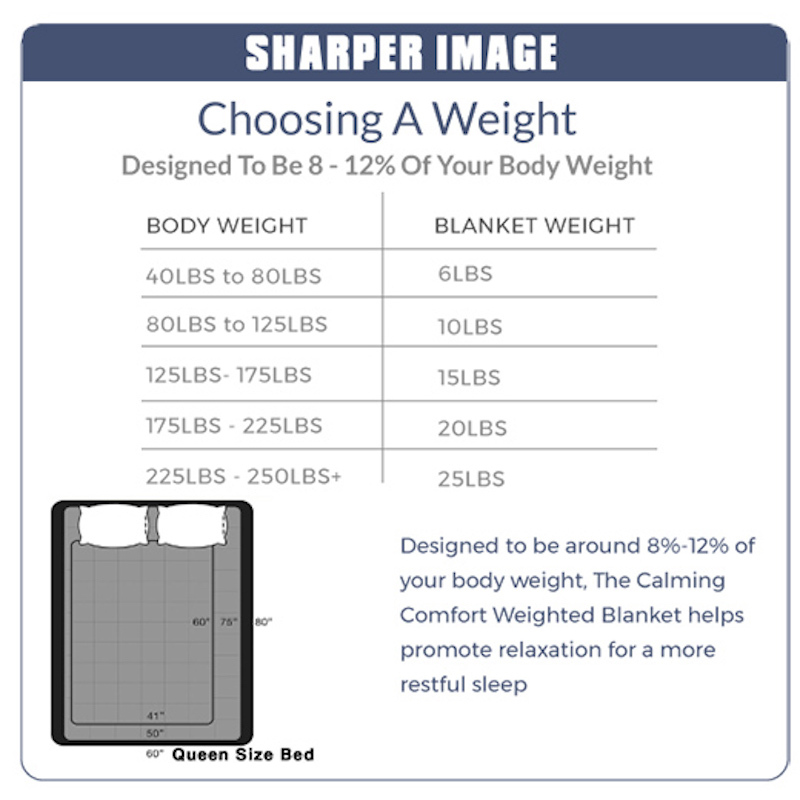 You can choose the one that best suits your needs knowing that this weighted quilt should weigh 8-12 % of what you currently weigh. The size of the 10 lb. blanket is 41 x 64 inches, while all the other weights have the same size- 50 x 75 inches. Calming comforter blankets are not suitable for anyone who weighs less than 80 lbs. so they are not really meant to be used by small children either. The lack of color options proves that Calming Comfort quilts were not designed with kids in mind too. There is only one available color, and that is dark grey so even the adults who prefer brighter colors might be disappointed. On the bright side, grey is a neutral color that goes well with any decor and adds to the calming effect of this comforter as well. 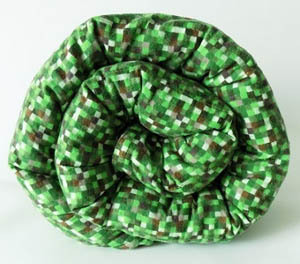 I like the outside of the Calming Comfort blanket- it has a velour-like texture that feels soft to the touch. The fabric is not only plush, but it is also breathable and hypoallergenic and can thus be used all year round. As most weighted blankets, Calming Comforter can be only hand-washed, and for this reason, it would be a good idea to buy a fitting duvet cover right away too. The manufacturer sells the matching duvet covers in three colors; grey, blue and pink. Using the cover can thus add the zest to your bedroom and resolve the lack of color options for the actual blanket. These colored duvet covers are machine washable as well! The weighted filling consists of BPA-Free high-density microbeads. The gridded stitching ensures that this filling always stays uniformly distributed. It seems though that some sections might have a bit more beads than the others, but it is not that noticeable and does not interfere with the overall effect of the comforter. Calming Comfort Weighted Blanket: How Effective is it? According to psychiatrists and sleep specialists, not all of us appreciate the effects of weighted blankets. If you like being hugged and swaddled chances are that you will love the Calming Comfort duvet as well; if not, you should better think twice before buying any weighted blanket. Regardless of being on the lower end of the price range, Calming Comforter provides almost the same positive results from anxiety, relaxation, and sleep perspectives, like any other weighted comforter on the market. Due to the design of this duvet, the weight is distributed well, and you feel the pressure evenly. The gridded stitching ensures that this blanket will last a long time too as the stuffing is less likely to come out and diminish the positive effects of your weighted blanket. The Calming Comfort blanket is sold by Allstar Products Group, NY-based company that has been in business from 1998. Two decades of serving customers account for a lot nowadays especially considering the mostly positive online customer reputation. They were part of the Sharper Image brand for a while but at the moment I am not quite sure what’s the status on that. 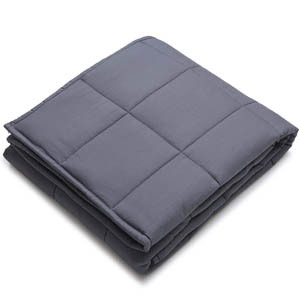 It seems thus that there is no need to pay a higher price for a weighted blanket when Calming Comfort does the job just right and comes with a 30-day satisfaction guarantee to make sure that you benefit from weighted blanket effects too.